I was Born and raised in Toronto, Canada, and it was there that I began my professional career while in College, designing toys and toy packaging for a small Canadian toy company. 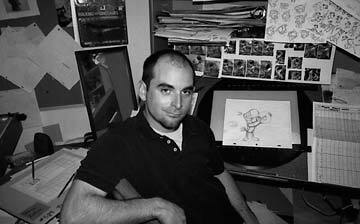 A year later I broke into the animation industry as a layout artist and animator at Nelvana Animation Ltd. and shortly after, emigrated to the Los Angeles area to work as a Feature animator, and here I stayed. In 1992 I started my Freelance career which allowed me the freedom to pursue many of my other interests in the visual medium: Storyboard, Design, Illustration, Sculpting and Layout. Throughout, I've had the pleasure of working with some of the top people and companies in Feature film, Television and Consumer Products. I enjoy the variety of my work with a passion, and always look forward to the next new challenge.